You might know Pier32 as the go-to place for charities to get their customised t-shirts, hoodies, hats and bags. We're proud that our ethical credentials have made us the first choice for organisations that need to know they're buying from a transparent and reputable source. But that doesn't just apply to charities. We work with universities up and down the country who know Pier32 are responsible, reliable and eco-friendly. 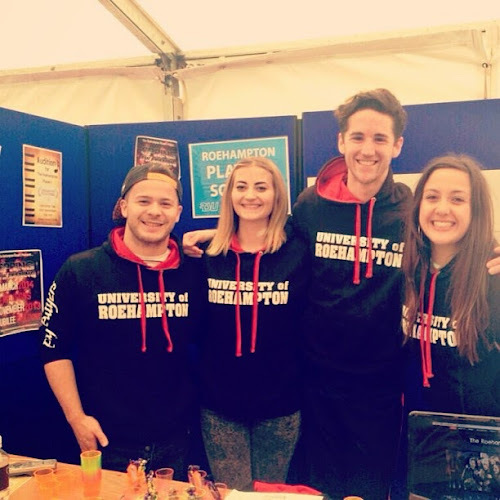 Take the guys at Roehampton University Players Society, who have a solid rep for rep... repertory theatre, that is! They've just ordered a box of hoodies from us to help advertise their upcoming show. Our House: The Madness Musical is, as you'd expect, a riotous assembly of tunes from Britain's favourite Nutty Boys. You can expect to hear all your favourite ska-pop hits, tied into a story of family, community and the essential elegance of the pork pie hat. Here are the guys from Roehampton in their Pier32-supplied hoodies. Looking good, guys! That's Pier32 for you. Always going One Step Beyond to help our clients. The Roehampton University Players are wearing Varsity Hoodies from All We Do Is, which are available in five sizes and 32 colour combinations. Could your society use some hoodies? Give Gerry or Ian a call, or check out the Pier32 website for more details and to order your own. 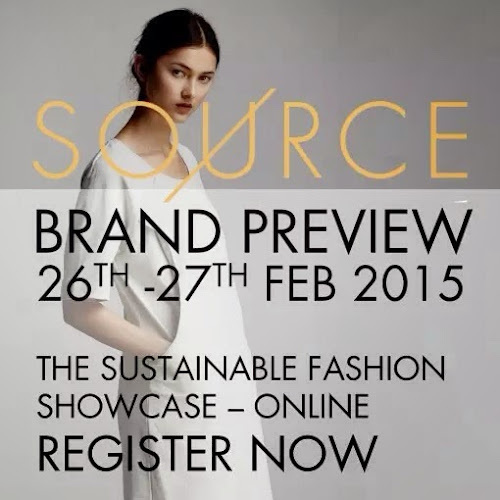 It doesn't seem like any time at all since the last Source Brand Preview, hosted by the Ethical Fashion Forum. And yet here we are, on the cusp of spring, and the first major event of the ethical fashion calender is almost upon us. The Source Brand Preview is a brilliant way for suppliers, manufacturers and designers to showcase their wares, and for buyers and writers to check out what's new and exciting for spring and summer 2015. Best of all, rather than shlepping out to one of the typical trade fair venues, the show takes place entirely online. No need to leave the office (or, if you're like me, to get out of your joggers and slippers). Top tip: use GoTo Meeting on your smartphone or tablet, and you can literally take the show with you. Using robust and proven conferencing tech, the Source Brand Preview guys are able to bring together a dazzling, world-wide array of participants that would otherwise have found it far too difficult and expensive to attend. This year's show features designers from as far afield as Africa, China and South-East Asia. Fashion is a global business, and the broad range of participants shows that off to a tee. There's something for everyone at this year's show, whether you're interested in atelier, accessories or good old basics. The two days of the show mean that you can drill down into a detailed look at the full spectrum of what's on offer, or dip in and out as the mood takes you. Best of all, because it's all taking place online, every session is archived so you can catch up later--especially handy if you find other business gets in the way of that one session you really didn't want to miss. That includes conversations in the chat boxes, so if you need to recontact a supplier you met during the show, it's a snap to sort out. It's tricky to sort out highlights with such a broad range of participants, but I'd expect to see some names familiar to View readers, like Riz Boardshorts. I'll be focussing on basics, menswear and atelier, but I'm ready and willing to be taken by surprise by what's on offer. Best of all, registration is free! Places are limited, but a few are still available if you get a wiggle on. Buyers from Liberty's and John Lewis, and writers from Vogue all consider the Source Brand Preview worth a look. If you have any interest in modern ethical fashion, you need to check this one out. I'll be around mostly on Friday: do feel free to pop me a chat if you're in the mood. For more, hit up the Ethical Fashion Forum. See you there! Charities working in the developing world are doing vital work, bringing essential services to the people who need them most. We've talked in the past about how our friends in the charity sector have brought irrigation techniques, help with farming and the chance for native artisans to become independent businesses and move away from charity handouts. But there's another, equally important benefit that one charity, with whom Pier32 have been proud to work, is bringing to the kids of East Africa. 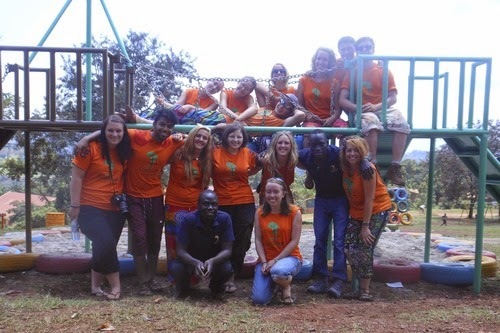 The volunteers of Team Buwenda, 2014. Nice t-shirts, guys! EAP work principally in Uganda, investing in the development of a dedicated team of local playground builders. They're supported each summer by 150 student volunteers from places like York (where the charity was founded in 2009). The local touch is vital: it's essential that the communities that will receive playgrounds are involved in its construction from breaking the ground to the first scamper across fresh monkey bars. EAP understand that a playground isn't just for the kids: it's a clear sign of community cohesion, a meeting place and focus for the parents of the kids that use it. EAP build playgrounds to exacting international standards, designed to be durable and long-lasting, so that they don't become unsafe over time. The construction teams spend time talking to the community and, most importantly, the kids, to ensure that the playground meets their needs and gives them everything they're hoping for. It's essential that the final build includes facilities for the four elements of play that children use to understand the world around them and develop life skills: Active, Game, Free and Imaginative play. The colourful playground at Mustard Hill Academy, one of EAP's recent builds. The playgrounds use recycled materials like tyres whenever they can, while ensuring a sturdy and above all safe construction ethic. 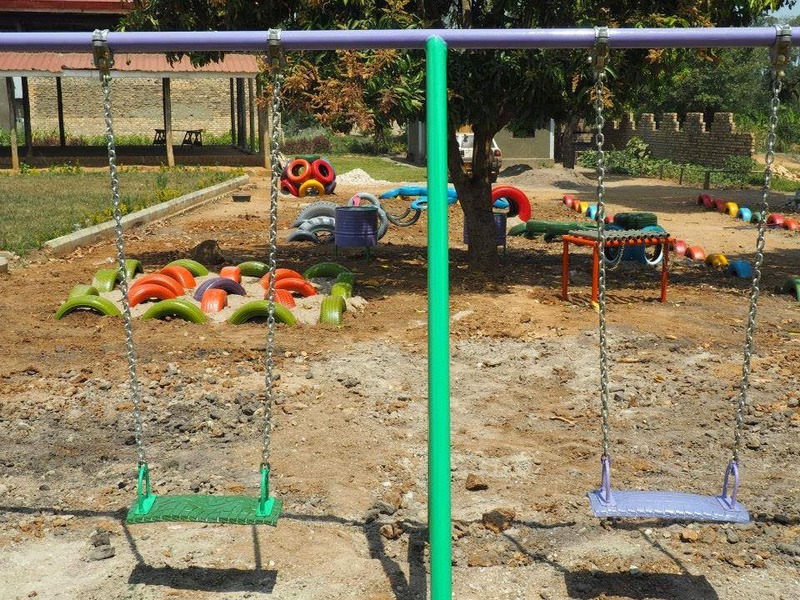 They work closely with the communities and schools that will use the playground, making sure that ongoing care of the project is considered once the build is complete. The onus is on building a community resource that will help generations of kids to play, have fun and grow. Here at the Pier, we couldn't be happier to help a charity who are doing such important work, and focussing on an essential element of a child's life that often gets sidelined in charity work. To find out more about East African Playgrounds, and perhaps to get involved yourself, check out their website, that will also tell you more about the importance of play. You're a responsible citizen, who believes in keeping your old stuff out of landfill where you can. You recycle your bottles and cans, and when it comes to those old clothes cluttering up the back of the wardrobe, you donate them to charity. But where do those old clothes go? The general assumption is that they pop up nationwide, in Oxfam, Helen Douglas or National Heart Foundation shops. You'd be wrong. The majority of donated clothes in this country are shipped abroad, as part of a £2.8billion worldwide trade in second-hand garments. The good news is that as our consumption of clothes rises, the amount of clothes sent to landfill is actually starting to drop. Nearly half of the garments we throw out are going to charity instead of incineration plants or the tip. But the assumption that those clothes are going to charity shops is, sadly, mistaken. Over 70% of clothing donations are sent overseas, where they will be sold for profit. "There's a moment of magic where a gift turns into a commodity. Like many used items, on the surface second-hand clothes may appear to have very little value, but through processes of sorting and transporting - turning disorderly objects into an ordered commodity - they are reproduced as retailable assets." In response to the problem, some organisations are cutting out the middlemen and starting up their own recycling schemes. For example, Oxfam now has its own recycling plant in West Yorkshire, which allows much more control over where donations end up, and has set up a scheme in Senegal employing locals to sort and re-distribute exports at fair prices back to the local economy. It's a drop in the bucket, admittedly, and no-one's naive enough to claim that this will end the trade overnight. It's also worth bearing in mind that the trade in second-hand garments has benefits up and down the supply chain, providing employment and, of course, keeping these valuable resources out of landfill. But awareness of where your clothes go after they go into the chute of the hopper outside your local Tesco has to be knowledge worth having. The truth is that your old shirts and coats are much more likely to end up in a street market in Uganda than an Oxfam in Uxbridge. We bang on about supply chain here at the Pier, but with good reason. The global fashion industry is a broad church, taking in worshippers from all sides. Your new shirt could be made from Indian cotton, sewn in Bangladesh, with buttons and fixings coming from China. There are dozens of different processes in a piece of modern clothing, that can mean it travels thousands of miles before it makes the final trip from the shop to your wardrobe. With that, of course, comes the potential for abuse. It's incredibly difficult for a big-name brand to guarantee that all the steps in the production of a given garment are carried out ethically and responsibly. Inspections, checks and contractual obligations can only go so far, and can be easily abused. It seems an impossible task to have a transparent and accountable supply chain if you're a global player. That's a situation that one of the biggest names in fashion, Levi Strauss, is trying to change, and they're doing it by using their significant financial clout. Quietly announced last November, they are making an offer to their suppliers that will be pretty hard to resist. Levi's have brokered a deal with the World Bank that allows them to offer low-cost funding to their suppliers from the International Finance Corporation if they sign up to and promise to abide by the brand's CSR: the sweetly named "Terms Of Engagement". These are some of the most worker-friendly guidelines on the market, using internationally recognised human and labour rights standards, like the Universal Declaration Of Human Rights. The rates offered by the IFC are some of the most competitive out there, and are highly attractive to players in markets like South Asia, where competition is fierce and funding is hard to find. In early meetings with suppliers in Bangladesh and Pakistan, all Levi's vendors expressed interest in taking up the scheme. The program has been very cleverly put together. It uses Levi's existing audit program, so no extra training or new processes are required. Vendors can simply sign up and carry on. But the smart bit comes with the terms of the deal. It's been designed on a sliding scale, that isn't weighted towards a particular benefit--that is, you don't get a preferential deal just for allowing your workers to unionise. The more boxes on the list of Terms Of Engagement you tick, the better your score. More importantly, there are penalties for non-compliance. Meaning that if you comply with the TOE completely and provably, you get bonuses and discounts. In short, it's in a supplier's best financial interests to do the right thing. Levi's call this "the race to the top". Rewarding suppliers for doing the right thing is a surprisingly radical move in fashion, but there's evidence that it could be the lever needed to get solid compliance to a set of labour, human rights and environmental terms that would otherwise have been unthinkable. Levi's take no prisoners in their CSR record, losing out only to Patagonia in sustainability, and scoring off the chart when it comes to auditing their suppliers. This is good news for those who wonder how accountable Levi's factories will be once they've signed up. Levi's record in some areas, such as indigenous rights in Cambodia, are less stellar, but this new program shows a company that is willing to admit its mistakes and show that it has learned from them. Are we about to see a situation where factories in the global supply chain compete to see just how ethical they can be? It'll be fascinating to find out! The Rana Plaza disaster of 2013 continues to resonate for all of us, not least because for many people in Dhaka, the effects still fill their lives. Their loved ones are gone, found and buried or still missing, lost to the rubble. These people need our love and our support. But above all, they need the companies whose clothes their mothers, fathers, sons and daughters died to make to step up, take the blame and help to rebuild those shattered lives. The UN's groundbreaking compensation and corporate responsibility scheme, set up for just this purpose, is doing its job well. But there's one holdout. That company is Benetton. And the pressure is on them to do the right thing. Let's consider just how remarkable the UN-sponsored Rana Plaza Agreement has been. Disasters like this one usually lead to multinationals simply denying their links and walking away. Here, that has not been the case. Images in the media of clothing labels scattered through the rubble make a clear case for responsibility, of course. The impetus has led to corporations, governments and factory owners to band together for the first time. But that accord is still delicately balanced, and one missing piece could send the whole structure crashing to the ground--a particularly jarring image given the context, but there you go. Benetton have claimed that their responsibility towards the victims of Rana Plaza ended after they donated to a local charity. The amount and indeed the name of the charity remain undisclosed. This is simply not good enough, and voices are starting to be raised in attempt to get Benetton to show a little respect to the people whose lives they ruined. With Milan Fashion Week approaching, Benetton are launching their spring collection with a heavy rollout on social media. This has not gone un-noticed. Social media activists Avaaz have set up a petition that already has over half a million signatures (including mine). If they double that, Avaaz promise that Benetton and Milan will see just how loud a million voices can be. You don't often think of the red carpet of the movie premiere as the place to showcase ethical fashion. Well, that's changed somewhat with the release of the brilliant spy movie Kingsman: The Secret Service. It's all thanks to the star of the movie, Colin Firth. Or rather, his secret weapon. His wife Livia. If you follow ethical fashion at all, the name Livia Firth should certainly be familiar to you. An eco-fashionista of many years standing, as head of brand consultancy Eco-Age she's been at the forefront of getting ethical clothes into the papers. Kingsman has been an opportunity to let hubby Colin show that you can look superspy-sharp without doing harm. His bespoke suit for the premiere of Kingsman was crafted by London tailor Martin Nicholls, to strict ISO 4001 environmental standards. Made exclusively in Yorkshire, the suit makes no compromises as to quality, fit and finish. If, as his character Harry Hart says in the film, the suit is the armour of the modern gentleman, then Firth is very much dressed to kill. None of this should be a surprise, of course. One of Livia Firth's major accomplishments has been the Green Carpet Challenge, which has persuaded A-list Hollywood stars to hit their premieres and the awards shows in ethical clothing. She's been known to rock up with Colin in upcycled clothing, and urges her actor pals to do the same. A tricky call, when the gossip rags will tear you a new one for daring to wear the same dress more than once. All the more reason for doing it, frankly, especially as the male stars can wear the one tux year-in, year-out without a single snide comment. Kingsman: The Secret Service is in UK cinemas now, and premieres in the US on February 13th. You can check out the Kingsman collection by Mr Porter here. My review of the film is over at my other gaff, film and culture blog Excuses And Half Truths. Take a look!